§ 55 After the synne of envye and of ire, now wol I speken of the synne of Accidie. For envye blyndeth the herte of a man, and ire troubleth a man, and Accidie maketh hym hevy, thoghtful, and wraw. Envye and ire maken bitternesse in herte, which bitternesse is mooder of Accidie, and bynymeth hym the love of alle goodnesse. Thanne is Accidie the angwissh of troubled herte; and Seint Augustyn seith, "it is anoy of goodnesse and joye of harm." Certes, this is a dampnable synne; for it dooth wrong to Jhesu Crist, in as muche as it bynymeth the service that men oghte doon to Crist with alle diligence, as seith Salomon. But Accidie dooth no swich diligence. He dooth alle thyng with anoy, and with wrawnesse, slaknesse, and excusacioun, and with ydelnesse, and unlust; for which the book seith, "acursed be he that dooth the service of God necligently." Thanne is Accidie enemy to everich estaat of man; for certes, the estaat of man is in three maneres. Outher it is th'estaat of innocence, as was th'estaat of Adam biforn that he fil into synne, in which estaat he was holden to wirche as in heriynge and adowrynge of God. Another estaat is the estaat of synful men, in which estaat men been holden to laboure in preiynge to God for amendement of hire synnes, and that he wole graunte hem to arysen out of hir synnes. Another estaat is th'estaat of grace; in which estaat he is holden to werkes of penitence. And certes, to alle thise thynges is Accidie enemy and contrarie, for he loveth no bisynesse at al. Now certes, this foule synne, Accidie, is eek a ful greet enemy to the liflode of the body; for it ne hath no purveaunce agayn temporeel necessitee; for it forsleweth and forsluggeth and destroyeth alle goodes temporeles by reccheleesnesse. § 56 The fourthe thyng is that Accidie is lyk hem that been in the peyne of helle, by cause of hir slouthe and of hire hevynesse; for they that been dampned been so bounde that they ne may neither wel do ne wel thynke. Of Accidie comth first, that a man is anoyed and encombred for to doon any goodnesse, and maketh that God hath abhomynacion of swich Accidie, as seith Seint John. § 57 Now comth Slouthe, that wol nat suffre noon hardnesse ne no penaunce. For soothly, slouthe is so tendre and so delicaat, as seith Salomon, that he wol nat suffre noon hardnesse ne penaunce, and therfore he shendeth al that he dooth. Agayns this roten-herted synne of Accidie and slouthe sholde men exercise hemself to doon goode werkes, and manly and vertuously cacchen corage wel to doon, thynkynge that oure lord Jhesu Crist quiteth every good dede, be it never so lite. Usage of labour is a greet thyng, for it maketh, as seith Seint Bernard, the laborer to have stronge armes and harde synwes; and slouthe maketh hem feble and tendre. Thanne comth drede to bigynne to werke anye goode werkes. For certes, he that is enclyned to synne, hym thynketh it is so greet an emprise for to undertake to doon werkes of goodnesse, and casteth in his herte that the circumstances of goodnesse been so grevouse and so chargeaunt for to suffre, that he dar nat undertake to do werkes of goodnesse, as seith Seint Gregorie. § 58 Now comth wanhope, that is despeir of the mercy of God, that comth somtyme of to muche outrageous sorwe, and somtyme of to muche drede, ymaginynge that he hath doon so muche synne that it wol nat availlen hym, though he wolde repenten hym and forsake synne; thurgh which despeir or drede he abaundoneth al his herte to every maner synne, as seith Seint Augustin. Which dampnable synne, if that it continue unto his ende, it is cleped synnyng in the Hooly Goost. This horrible synne is so perilous that he that is despeired, ther nys no felonye ne no synne that he douteth for to do; as shewed wel by Judas. Certes, aboven alle synnes thanne is this synne moost displesant to crist, and moost adversarie. Soothly, he that despeireth hym is lyk the coward champious recreant, that seith, "creant" withoute nede, Allas! akkas! bedekes us he recreant and nedelees despeired. Certes, the mercy of God is evere redy to the penitent, and is aboven alle his werkes. Allas! kan a man nat bithynke hym on the gospel of Seint Luc, 15, where as Crist seith that "as wel shal ther be joye in hevene upon a synful man that dooth penitence, as upon nynty and nyne rightful men that neden no penitence." Looke forther, in the same gospel, the joye and the feeste of the goode man that hadde lost his sone, whan his sone with repentaunce was retourned to his fader. Kan they nat remembren hem eek that, as seith Seint Luc, 23, how that the theef that was hanged bisyde Jhesu Crist, seyde "lord, remembre of me, whan thow comest into thy regne? "For sothe," seyde Crist, "I seye to thee, to-day shaltow been with me in paradys." Certes, ther is noon so horrible synne of man that it ne may in his lyf be destroyed by penitence, thurgh vertu of the passion and of the deeth of Crist. Allas! what nedeth man thanne to been despeired, sith that his mercy so redy is and large? Axe and have. Thanne cometh sompnolence, that is, sloggy slombrynge, which maketh a man be hevy and dul in body and in soule; and this synne comth of slouthe. And certes, the tyme that, by wey of resoun, men sholde nat slepe, that is by the morwe, but if ther were cause resonable. For soothly, the morwe tyde is moost covenable a man to seye his preyeres, and for to thynken on God, and for to honoure God, and to yeven almesse to the povre that first cometh in the name of Crist. Lo, what seith Salomon "whoso wolde by the morwe awaken and seke me, he shal fynde." Thanne cometh necligence, or reccheleesnesse, that rekketh of no thyng. And how that ignoraunce be mooder of alle harm, certes, necligence is the norice. Necligence ne dooth no fors, whan he shal doon a thyng, wheither he do it weel or baddely. § 59 Of the remedie of thise two synnes, as seith the wise man, that he that dredeth god, he spareth nat to doon that him oghte doon. And he that loveth god, he wol doon diligence to plese God by his werkes, and abaundone hymself, with al his myght, wel for to doon. Thanne comth ydelnesse, that is the yate of alle harmes. An ydel man is lyk to a place that hath no walles; the develes may entre on every syde, or sheten at hym at discovert, by temptacion on every syde. This ydelnesse is the thurrok of alle wikked and vileyns thoghtes, and of alle jangles, trufles, and of alle ordure. Certes, the hevene is yeven to hem that wol labourn, and nat to ydel folk. Eek David seith that "they ne been nat in the labour of men, ne they shul nat been whipped with men," that is to seyn, in purgatorie. Certes, thanne semeth it, they shul be tormented with the devel in helle, but if they doon penitence. § 60 Thanne comth the synne that men clepen tarditas, as whan a man is to laterede or tariynge, er he wole turne to God; and certes, that is a greet folie. He is lyk to hym that falleth in the dych, and wol nat arise. And this vice comth of a fals hope, that he thynketh that he shal lyve longe; but that hope faileth ful ofte. § 61 Thanne comth lachesse; that is he, that whan he biginneth any good werk, anon he shal forleten it and stynten; as doon they that han any wight to governe, and ne taken of hym namoore kep, anon as they fynden any contrarie or any anoy. Thise been the newe sheepherdes that leten hir sheep wityngly go renne to the wolf that is in the breres, or do no fors of hir owene governaunce. Of this comth poverte and destruccioun, bothe of spiritueel and temporeel thynges. Thanne comth a manere cooldnesse, that freseth al the herte of a man. Thanne comth devoccioun, thurgh which a man is so blent, as seith Seint Bernard, and hath swich languour in soule that he may neither rede ne singe in hooly chirche, ne heere ne thynke of no devoioun, ne travaille with his handes in no good werk, that it nys hym unsavory and al apalled. Thanne wexeth he slough and slombry, and soone wol be wrooth, and soone is enclyned to hate and to envye. Thanne comth the synne of worldly sorwe, swich as is cleped tristicia, that sleeth man, as seith Seint Paul. For certes, swich sorwe werketh to the deeth of the soule and of the body also; for therof comth that a man is anoyed of his owene lif. Wherfore swich sorwe shorteth ful ofte the lif of man, er that his tyme be come by wey of kynde. § 62 Agayns this horrible synne of Accidie, an the branches of the same, ther is a vertu that is called fortitudo or strentthe, that is an affeccioun thurgh which a man despiseth anoyouse thinges. This vertu is so myghty and so vigerous that it dar withstonde myghtily and wisely kepen hymself fro perils that been wikked, and wrastle agayn the assautes of the devel. For it enhaunceth and enforceth the soule, right as Accidie abateth it and maketh it fieble. For this fortitudo may endure by long suffraunce the travailles that been covenable. § 63 This vertu hath manye speces; and the firste is cleped magnanimitee, that is to seyn, greet corage. For certes, ther bihoveth greet corage agains Accidie, lest that it ne swolwe the soule by the synne of sorwe, or destroye it by wanhope. This vertu maketh folk to undertake harde thynges and grevouse thynges, by hir owene wil, wisely and resonably. And for as muchel as the devel fighteth agayns a man moore by queyntise and by sleighte than by strengthe, therfore men shal withstonden hym by wit and by resoun and by discrecioun. Thanne arn ther the vertues of feith and hope in God and in his seintes, to acheve and acomplice the goode werkes in the whiche he purposeth fermely to continue. Thanne comth seuretee or sikernesse; and that is whan a man ne douteth no travaille in tyme comynge of the goode werkes that a man hath bigonne. Thanne comth magnificence, that is to seyn, whan a man dooth and perfourneth grete werkes of goodnesse; and that is the ende why that men sholde do goode werkes, for in the acomplissynge of grete goode werkes lith the grete gerdoun. Thanne is ther constaunce, that is, stablenesse of corage; and this sholde been in herte by stedefast feith, and in mouth, and in berynge, and in chiere, and in dede. Eke ther been mo speciale remedies against Accidie in diverse werkes, and in consideracioun of the peynes of helle and of the joyes of hevene, and in the trust of the grace of the holy goost, that wole yeve hym myght to perfourne his goode entente. After the sins of envy and of anger, now will I speak of the sin of acedia, or sloth. For envy blinds the heart of a man and anger troubles a man; and acedia makes him heavy, thoughtful, and peevish. Envy and anger cause bitterness of heart; which bitterness is the mother of acedia, and takes from a man the love of all goodness. Then is acedia the anguish of a troubled heart; and Saint Augustine says: "It is the sadness of goodness and the joy of evil." Certainly this is a damnable sin; for it wrongs Jesus Christ in as much as it lessens the service that men ought to give to Christ with due diligence, as says Solomon. But sloth has no such diligence; it does everything sadly and with peevishness, slackness, and false excusing, and with slovenliness and unwillingness; for which the Book says: "Accursed be he that serveth God negligently." Then acedia is the enemy to every state of man; for indeed the state of man is in three degrees. One is the state of innocence, as was the condition of Adam before he fell into sin; in which state he was maintained to praise and adore his God. Another state is the condition of sinful men wherein they are obliged to labour in praying to God for the amendment of their sins. Another state is the condition of grace, in which condition man is bound to acts of penitence; and truly, to all these things acedia is the enemy and the opposite. For it loves no busyness at all. Now certainly this foul sin of acedia is also a great enemy to the livelihood of the body; for it makes no provision for temporal necessity; for it wastes, and it allows things to spoil, and it destroys all worldly wealth by its carelessness. The fourth thing is that acedia is like those who are in the pain of Hell, because of their sloth and their sluggardliness; for those that are damned are so bound that they may neither do well nor think well. First of all, from the sin of acedia it happens that a man is too sad and hindered to be able to do anything good, wherefore God abominates acedia, as says Saint John. Then comes that kind of sloth that will endure no hardship nor any penance. For truly, sloth is so tender and so delicate, as Solomon says, that it will endure no hardship or penance, and therefore it spoils everything that it attempts to do. To combat this rotten-hearted sin of acedia or sloth, men should be diligent to do good works and manfully and virtuously to come by the determination to do well; remembering that Our Lord Jesus Christ rewards every good deed, be it ever so little. The habit of labour is a great thing; for, as Saint Bernard says, it gives the labourer strong arms and hard thews, whereas sloth makes them feeble and tender. Then arises the dread of beginning to do any good deeds; for certainly, he that is inclined toward sin, he thinks it is so great an enterprise to start any works of goodness, and tells himself in his heart that the circumstances having to do with goodness are so wearisome and burdensome to endure, that he dare not undertake any such works, as says Saint Gregory. 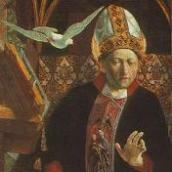 Now enters despair, which is despair of the mercy of God, and comes sometimes of too extravagant sorrows and sometimes of too great fear: for the victim imagines that he has done so much sin that it will avail him not to repent and forgo sin; because of which fear he abandons his heart to every kind of sin, as Saint Augustine says. This damnable sin, if it be indulged to the end, is called sinning in the Holy Ghost. This horrible sin is so dangerous that, as for him that is so desperate, there is no felony or sin that he hesitates to do; as was well showed by Judas. Certainly, then, above all other sins, this sin is most displeasing to Christ, and most hateful. Truly he that grows so desperate is like the cowardly and recreant combatant that yields before he is beaten, and when there is no need. Alas, alas! Needlessly is he recreant and needlessly in despair. Certainly the mercy of God is always available to every penitent, and this is the greatest of all God's works. Alas! Cannot a man bethink him of the gospel of Saint Luke, 15, wherein Christ says: "Joy shall be in Heaven over one sinner that repenteth more than over ninety and nine just persons which need no repentance." Behold further, in the same gospel, the joy of and the feast given by the good man who had lost his son, when his son, repentant, returned to his father. Can they not remember, also, that, as Saint Luke says, XXIII capitulo, the thief who was hanged beside Jesus Christ said: "Lord, remember me when Thou comest into Thy Kingdom." "Verily," said Christ, "I say unto thee, today shalt thou be with me in Paradise." Certainly, there is no such horrible sin of man that it may not be, in his lifetime, destroyed by penitence, by virtue of the passion and the death of Jesus Christ. Alas! Why then need a man despair, since mercy is so ready and so great? Ask, and it shall be given unto you. Then enters somnolence, that is to say, sluggish slumbering, which makes a man heavy and dull in body and in soul; and this sin comes from sloth. And truly, the time that a man should not sleep, in all reason, is the early morning, unless there be a reasonable necessity. For verily the morningtide is most suitable for a man to say his prayers, and to meditate on God and to honour God, and to give alms to the poor person who first asks in the name of Christ. Behold what Solomon says: "Whoso would awake in the dawn and seek me, me shall he find." Then enters negligence, or carelessness, that recks of nothing. And if ignorance is the mother of all evil, certainly then negligence is the nurse. Negligence cares not, when it must do a thing, whether it be well done or badly. As to the remedies for these two sins, as the wise man says: "He that fears God spares not to do that which he ought." And he that loves God, he will be diligent to please God by his works, and will exert himself, with all his might, to do well. Then enters idleness, which is the gate to all evils. An idle man is like a house that has no walls; the devils may enter on every side and shoot at him, he being thus unprotected, and tempt him on every side. This idleness is the sink of all wicked and villainous thoughts, and of all idle chattering, and trifles, and of all filthiness. Certainly Heaven is for those that labour, and not for idle folk. Also, David says: "They are not among the harvest of men and they shall not be threshed with men," which is to say, in Purgatory. Certainly, then, it appears that they shall be tormented by the Devil in Hell, unless they soon repent. Then enters the sin that men call tarditas, which is when a man is too tardy or too long-tarrying before he turns unto God; and certainly this is a great folly. He is like one that falls in the ditch and will not arise. And this vice comes of a false hope whereunder a man comes to think that he shall live long; but that hope full often fails him. Then comes laziness; that is when a man begins any work and anon forgoes it and holds his hand; as do those who have anyone to govern and who take no care of him as soon as they find any difficulty or annoyance. These are the modern shepherds who knowingly allow their sheep to run to the wolf in the briers, or have no care for their governing. Of this come poverty and the destruction of both spiritual and temporal things. Then comes a kind of dull coldness that freezes the heart of man. Then comes lack of devotion, whereby a man is so blinded, as Saint Bernard says, and has such languor of soul, that he may not read or sing in holy church, nor hear or think of anything devout, nor toil with his hands at any good work, without the labour being unsavoury and vapid to him. Then he grows slow and slumbery, and is easily angered and is easily inclined toward hate and envy. Then comes the sin of worldly sorrow, such as is called tristicia, which slays men, as Saint Paul says. For, verily, such sorrow works the death of the soul and of the body also; for thereof it comes to pass that a man is bored by his own life. Wherefore such sadness full often shortens a man's life before his time has naturally come. Against this horrible sin of acedia, and the branches thereof, there is a virtue that is called fortitudo or strength; that is, a force of character whereby a man despises annoying things. This virtue is so mighty and so vigorous that it dares to withstand sturdily, and wisely to keep itself from dangers that are wicked, and to wrestle against the assaults of the Devil. For it enhances and strengthens the soul, just as acedia reduces it and makes it feeble. For this fortitudo can endure, by long suffering, the toils that are fitting. This virtue has many species; and the first is called magnanimity, which is to say, great-heartedness. For certainly a great heart is needed against acedia, lest it swallow up the soul by the sin of sadness, or destroy it by despair. This virtue causes folk to undertake hard things, or grievous things, of their own initiative, wisely and reasonably. And for as much as the Devil fights a man more by craft and by trickery than by strength, therefore men may withstand him by wit and by reason and by discretion. Then there are the virtues of faith and of hope in God and in His saints, to achieve and accomplish the good works in which one firmly purposes to continue. Then comes security and certainness; and that is when a man shall not doubt, in time to come. the value of the toil of the good works that he has begun. Then comes munificence, which is to say, that virtue whereby a man performs great works of goodness that he has begun; and that is the goal to reach which men should do good works; for in the doing of great good works lies the great reward. Then there is constancy, that is, stability of purpose, and this should be evidenced in heart by steadfast faith, and in word and in attitude and in appearance and in deed. Also, there are other special remedies against acedia or sloth, in divers works, and in consideration of the pains of Hell and of the joys of Heaven, and in faith in the grace of the Holy Ghost, that will give to a man the strength wherewith to perform his good purpose.